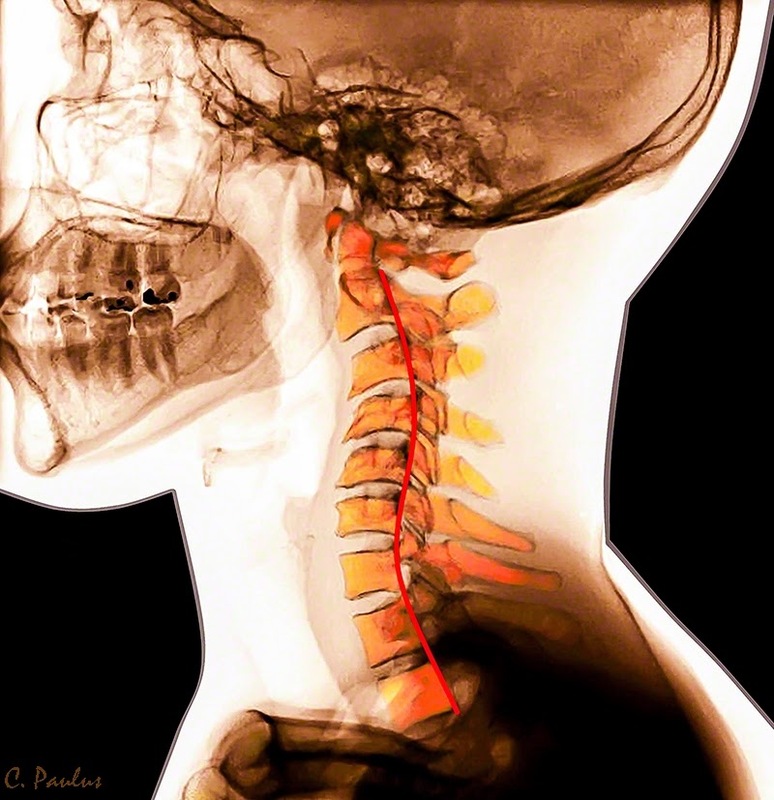 Medical Media Images Blog: What is "Cervical Spondylotic Myelopathy" (CSM)? A Cervical Spondylotic Myelopathy (CSM) is a disease which affects patients who have severe degenerative spine disease. Rather than just suffering from degenerative disc disease or facet joint disease, these patients also have severe spinal stenosis and compression of the spinal cord. This is beyond the normal degenerative process of an aging spine. These patients have a much more severe degenerative process of the cervical spine. Most patients who suffer from CSM are over the age of 50. Many patients will experience a steady progression of their disease. What is the difference between a Cervical Spondylotic Myelopathy and a Cervical Myelopathy? A Cervical Spondylotic Myelopathy is a combination of severe, widespread degenerative spine disease and spinal cord compression. A Cervical Myelopathy is spinal cord compression which can be from any cause in the neck. The spine does not have to be severely degenerated. An example is a disc herniation at one level of the spine, where the herniation is so large that it places pressure on the spinal cord. What are some of the common symptoms from a Cervical Spondylotic Myelopathy? How do spine specialists diagnose a Cervical Spondylotic Myelopathy? Do you have a difficult time walking? Do you feel like you are having problems with your balance? Do you lose your balance if you are in a darker room? Do you have weakness in the arms? Legs? Do you have numbness or tingling in your arms or legs? Do your shoulders feel weak? Do you have trouble emptying your bladder? Do you ever lose control over your bowels? X-Rays can be helpful to establish the anatomy of the neck. They can offer some information about the height of a disc, but not compression of the spinal cord. However the severe disc and facet joint degeneration typical for a Cervical Spondolytic Myelopathy can be seen. Here is a Color X-Ray which shows severe degeneration of the neck Vertebrae. Several discs have degenerated to a point where the normal C-Shaped Curvature of the neck has been replaced by a degenerative S-Shape. MRI information is critical when evaluating the severe spinal stenosis found in Cervcial Spondylotic Myelopathy. 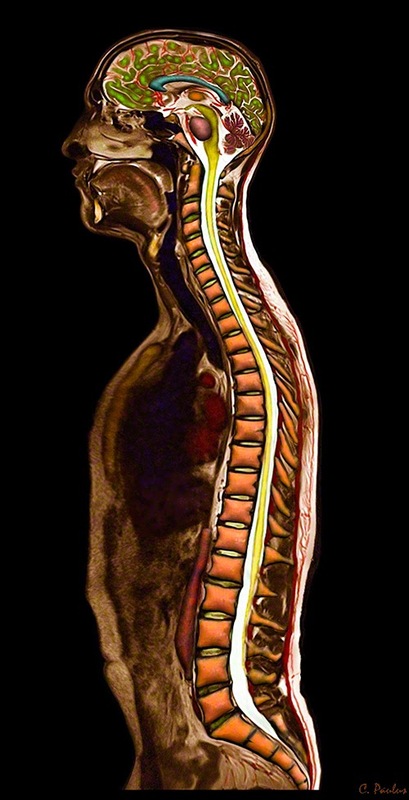 It can show the spinal cord and spinal nerves in detail and can accurately assess how much compression of each exists. It can also determine if there is swelling present in the spinal cord (gliosis). This can be a sign of impending damage or existing damage to the spinal cord. 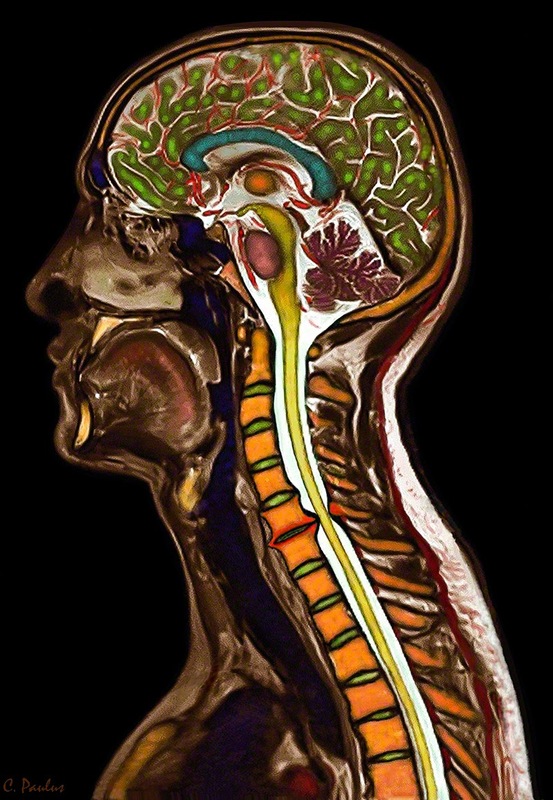 Here is a color MRI of the neck, showing a compressed Spinal Cord. CT scans can show the bone anatomy of the cervical spine including the spinal canal accurately. However they have the disadvantage of not being able to show the spinal nerves and spinal cord in detail. A CT Myelogram can show the compression of the Spinal Cord very well. However, it also carries a significant exposure to radiation. This exam is typically reserved for patients who have metal implants in the neck. What kind of treatment do spine specialists use for a Cervical Spondylotic Myelopathy? The treatment for a Cervical Spondylotic Myelopathy depends on the severity of the case. Surgery is reserved for severe conditions not responding to non-surgical care. Alternative Health Care options may help with the pain from a Cervical Spondylotic Myelopathy, but are not likely to change the compression of the spinal cord and any neurological problems related to that. Acupuncture, Massage Therapy, and Meditation can be useful to help with the pain from this condition. Generally, spine manipulation is not recommended for conditions with Spinal Cord Compression, such as CSM. However, very gentle, non-manipulation treatments may have some benefit. Spine exercises can help prevent the loss of muscle mass from CSM. However, only gentle exercises are recommended due to the compression of the spinal cord. High impact exercises could potentially worsen this condition. PT can also help maintain the function and mass of muscles affected by CSM. However, only gentle forms of PT are recommended. Traction can help with compressed spinal nerves, but not compression of the spinal cord. It is not commonly used for this condition, unless the patient is not a candidate for surgery and it is deemed safe. Ultrasound and electrical stimulation can help with the muscle spasms common in this condition. Strengthening exercises can help maintain muscle strength. Self Help Devices such as Neck Braces and Neck Pillows can help provide comfort for this condition. A brace may be needed for advances stages of a Cervical Spondylotic Myelopathy to protect the spinal cord from further injury. Motion is restricted by the brace to prevent significant bending of the neck, which could increase the pressure on the spinal cord. Epidural steroid injections can help with some of the symptoms from a Cervical Spondylotic Myelopathy. However, with severe spinal cord compression, injections are usually not done out of fear that the injected fluid places more pressure on the spinal cord. For milder, non-surgical cases of Cervical Spondylotic Myelopathy, epidural injections such as Cervical Interlaminar Epidural Injections can be used. Severity of the symptoms. Specifically neurological symptoms such as weakness in the arms and legs, gait problems, and problems with the bowels and bladder. Here are some surgical options which are available for a Cervical Spondylotic Myelopathy.